UPDATED – BALTIMORE (CNS) — The Panamanian archbishop helping to organize World Youth Day said the 2019 celebration in his country will invite youth of other faiths to join in. Archbishop Ulloa said Pope Francis told him not to model the event after previous World Youth Day celebrations, but to give the upcoming one a distinct flavor of the realities of Latin America. The event will touch on themes of immigration, which has affected youth, including some who migrate to escape violence in some parts of Central America, on protecting “the common home,” meaning ecological issues, and will feature martyrs and saints of Latin America, including Blessed Oscar Romero, as models for the youth, the archbishop said. Because Latin America is home to a variety of ethnic cultures, the celebration will be intercultural, said Archbishop Ulloa. It also will look at the “martyrial” aspect of the church and of the suffering of its people. “We cannot conceive of a Latin American reality without the presence of Mary,” Archbishop Ulloa said. An important theme tied to Mary was her ability to say “yes” to God, and it will be emphasized as youth are presented with vocational opportunities, and told how Mary as a youth allowed her life to be guided by what God wanted, putting her trust and fate in God’s hands, the archbishop said. That meant, he later said, that as youth, they shouldn’t be afraid to bring new ideas to the church, to pose to their elders how to do something different, to shake things up and “breathe something new” into the church. 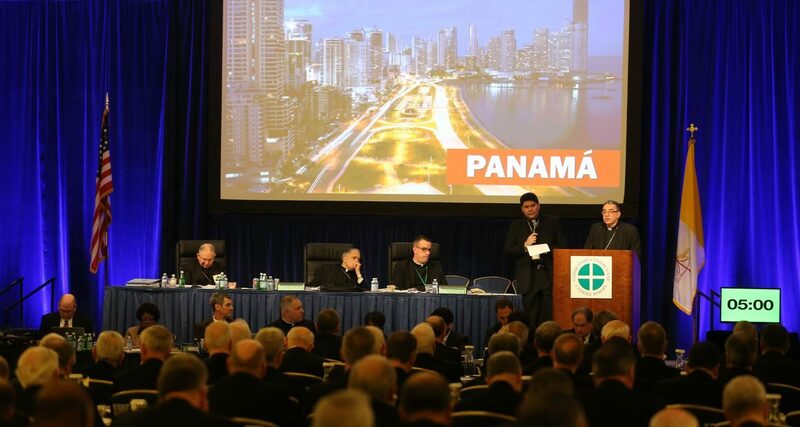 In his address to the bishops Nov. 13, Archbishop Ulloa said World Youth Day, set for Jan. 22-27, 2019, will take place during the time of the best weather in the country. The archbishop spoke in Spanish, but his remarks were translated in English. The archbishop said World Youth Day pilgrims would encounter a church that is alive and a country that has a big heart. He said the number of participants could be about 300,000. Lodging for participants will be in local schools, gyms, community and retreat centers, and hotels. The event would follow the typical World Youth Day schedule with catechesis and an opportunity to be with the pope for the Way of the Cross, a vigil Mass and a closing Mass.